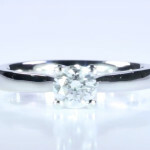 A very fine quality round shaped brilliant diamond set in a Platinum Lady’s Ring which can also be used as a wedding ring. This ring is a Life stone ring for natives with Lagna of Taurus & Libra to enhance their health, stability, confidence and provide defence from any crisis. It is an important ring for natives with lagna of Aquarius and Capricorn for rise in Luck, prosperity, name, fame establishment, peace of mind, properties, assets, family happiness, professional status, prestige, honour, recognition, appreciation, creativities, common sense, wisdom and decision making strategy, luxuries & life style. Try these Rings and you will surely ”Discover the Difference” and experience the highest benchmarked quality standard in the industry.